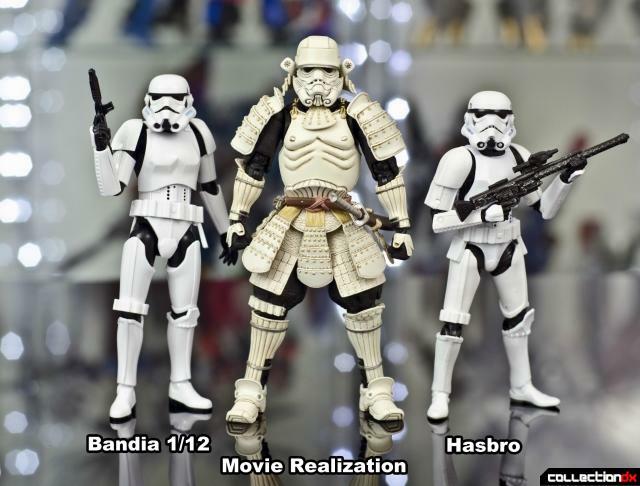 The Movie Realization line is a re-imagining of classic Star Wars characters with a feudal Japanese theme. 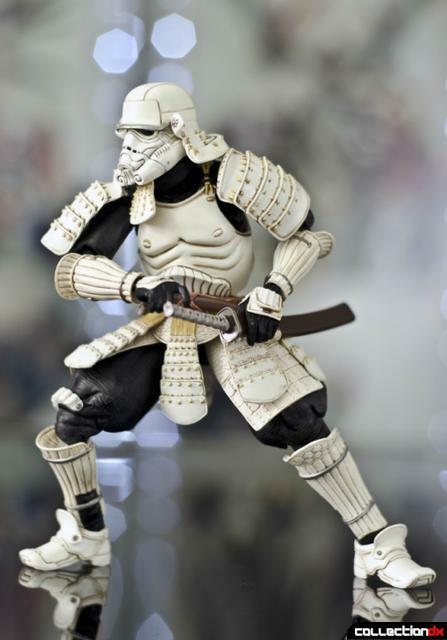 The Ashigaru Stormtrooper is based on the ancient Ashigaru, foot soldiers employed by the samurai class. 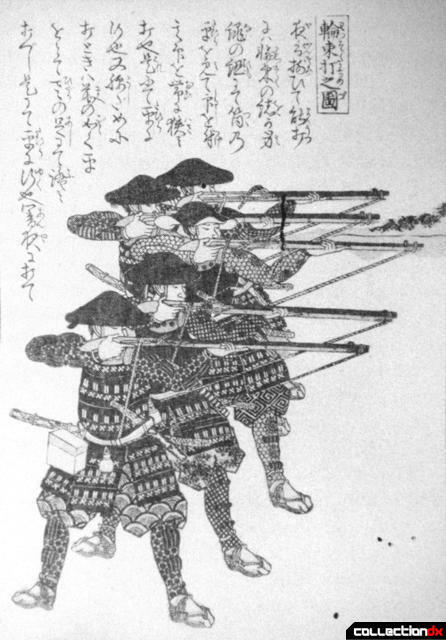 The Ashigaru box is made up of three parts with an outer cardboard shell the sounds an inner clam shell. 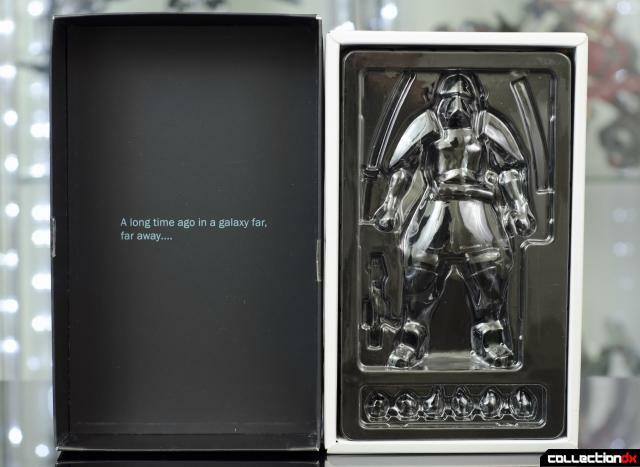 The box has great art work on the front and sides and even has the classic Star Wars tag line on the side. 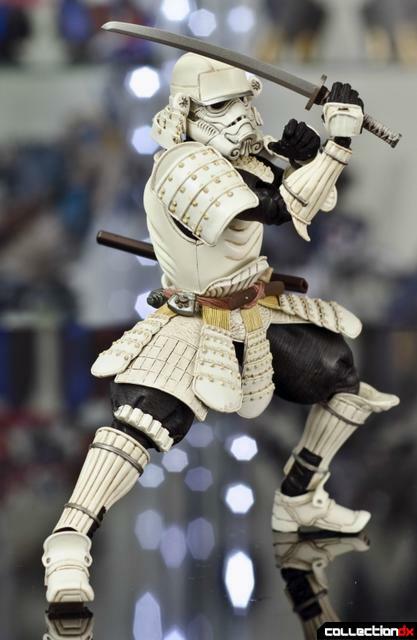 The figure itself is superbly detailed and painted, down to the insides of the knee armor and bottoms of the feet. 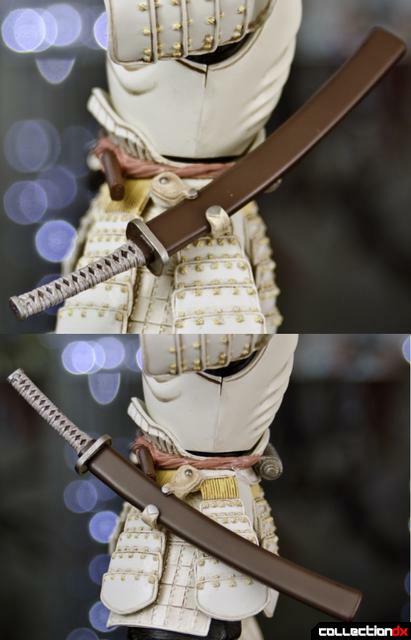 Even the tiny stitches on the waist and shoulder armor are painted yellow. The only place that isn't sculpted or painted is the inside of the shoulder pads. It would have been nice to have a little bit of sculpting there, but it is not readily visible, so I won’t lose any sleep over it. 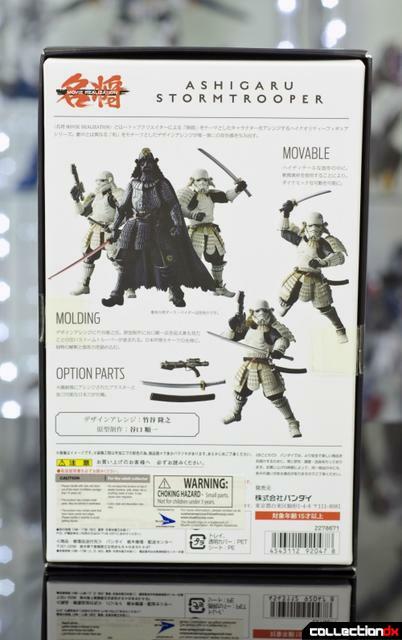 While it does not feature any diecast, the figure has an excellent weight and very nice balance. 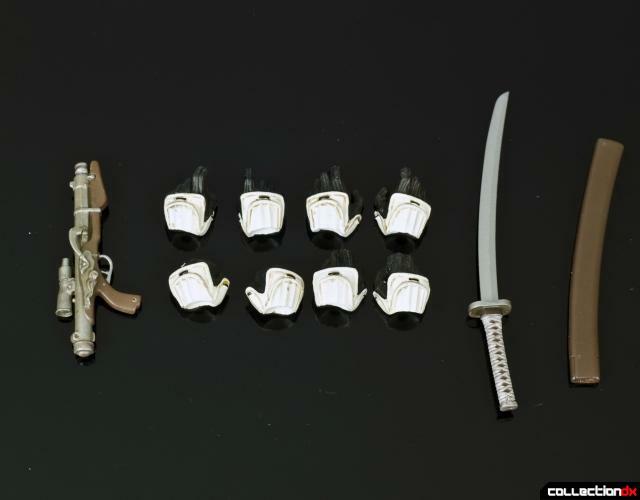 Accessories include four pairs of hands, a katana, scabbard, and flintlock blaster. 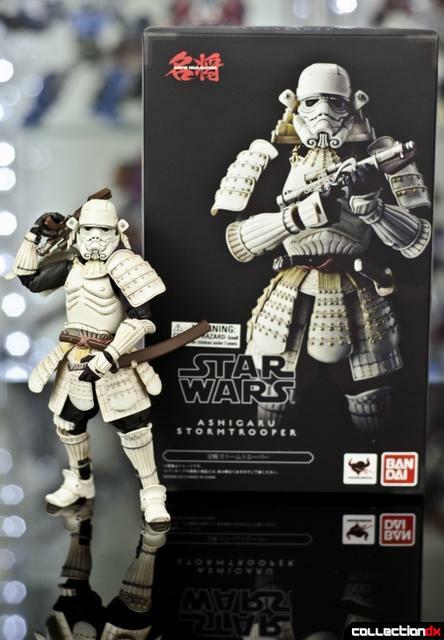 The Ashigaru Stormtrooper is in seven inch scale which might be disappointing for some who want to display this release with Bandai or hasbro 6 inch Star Wars releases. The articulation is above average such a bulky figure. He’s not going to be doing any three point Iron Man poses, but his range of motion is more than enough to kneel and pull off some very nice dynamic poses. The articulation breakdown is as follows, ball jointed neck, ball jointed / universal shoulders, double jointed elbows, universal jointed wrists, ball jointed waist, ball jointed hips, double jointed knees, and universal jointed ankles. 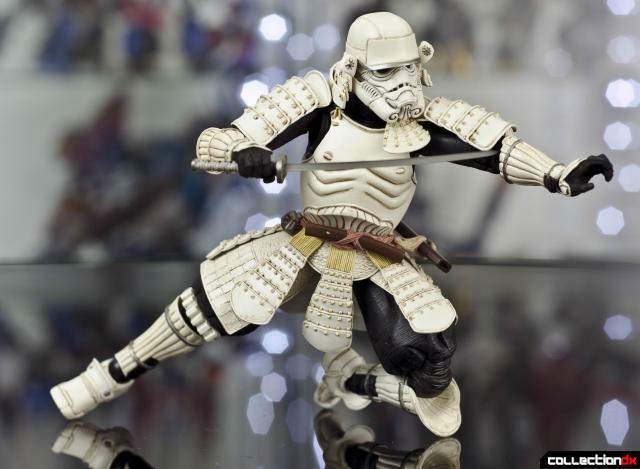 The waist armor is not articulated per say, but it is soft plastic and moves around nicely and does not impair the leg range of motion at all. My only problem with the articulation, and really my only problem with the figure in general, is his ankle joints. 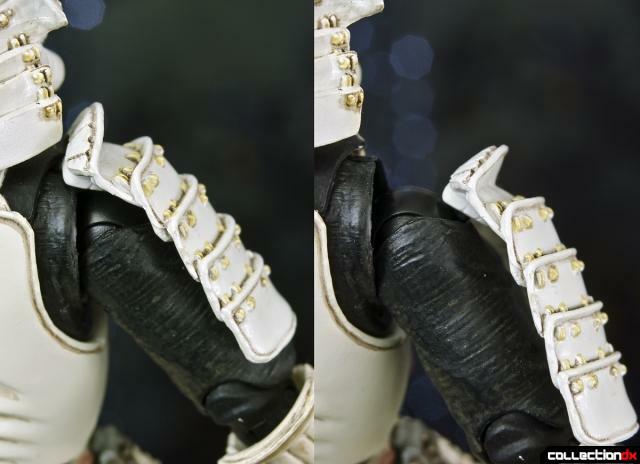 The ankle uses a universal joint that pegs directly into the top of the foot instead of at an angle (ala Marvel legends / Black Series). What this means is that for the foot to be flat on the ground when the legs are spread wide, the joint has to be manually rotated into the proper angle which can take some trial and error. It’s not a huge deal, but it does make posing a little harder than it needs to be. The shoulder armor is on a sliding ball joint and is easy to move out of the way when posing the arms. 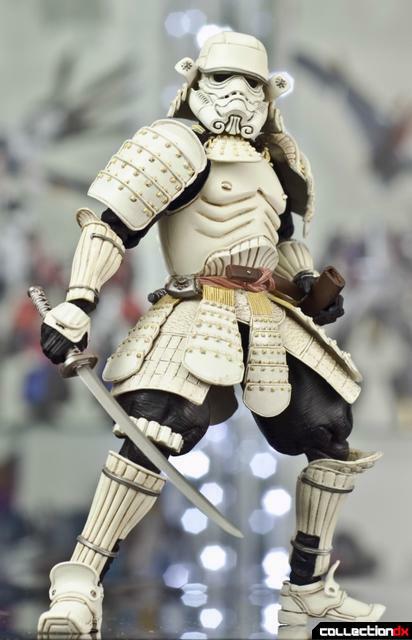 Its also worth mentioning that when the sword is mounted to the figures hip, it can be swung forward and backward to allow it to stay out of the way. All of the hands are very well sculpted allow for a wide range of emoting. The hand for gripping the gun actually has a trigger finger that goes inside the trigger guard which I thought was a nice bit of detailing. 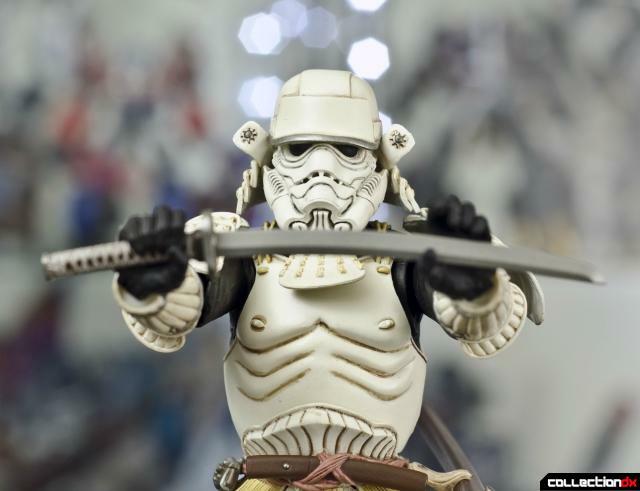 Overall the Ashigaru Stormtrooper is a winner in my book. 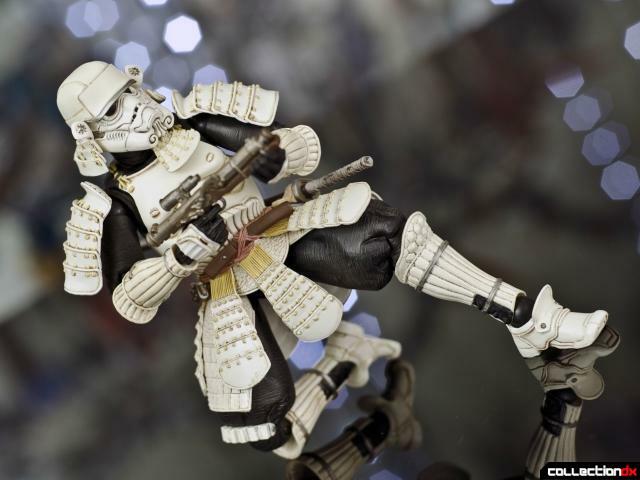 It has top notch paint and detailing and enough articulation to pull off a wide variety of poses. The design might not be for everyone, but I think it brings a nice touch of diversity to my Star Wars collection. 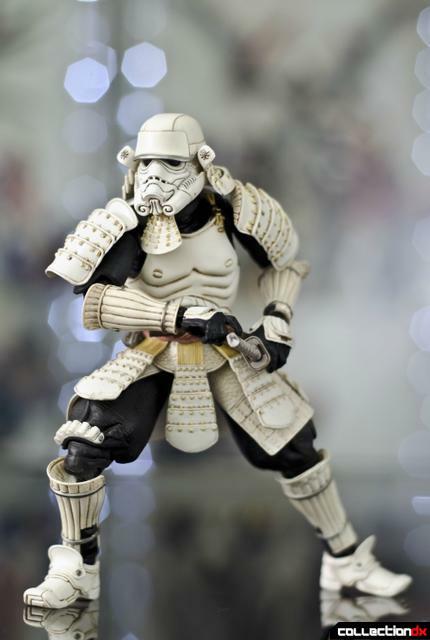 Now I'm just wondering whether this new storm trooper can hit anything, or if he's as aimless as the rest. Regardless, super cool figure! I'm glad I didn't commit to this line. I'd end up wanting all of them. Are you getting the others? Absolutely! 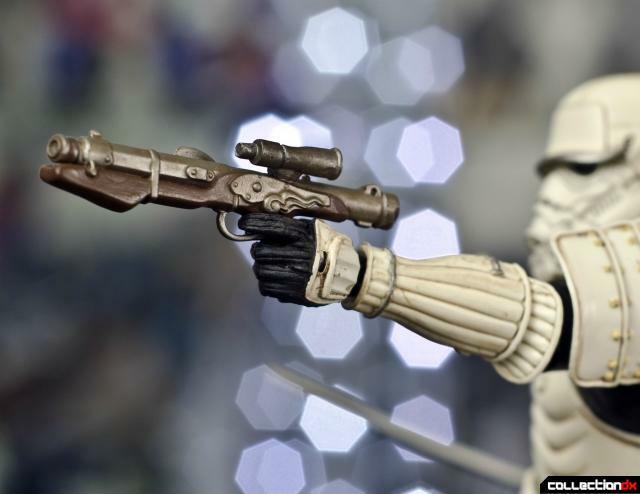 I have Vader already and have Fett and the Royal Guard on preporder. Really wanted his guy, but I didn't realize how big and expensive he was gona be! When it came down to preordering, I couldn't go through with it. For some reason I didn't run in to too many reviews, which is kinda surprising. I don't know when I'll be able to get one of these, but it's nice to see that they look worth the cash! Too many times I go outside my usual buying habits on a more expensive figure and it ends up being fragile and not much fun to play with. 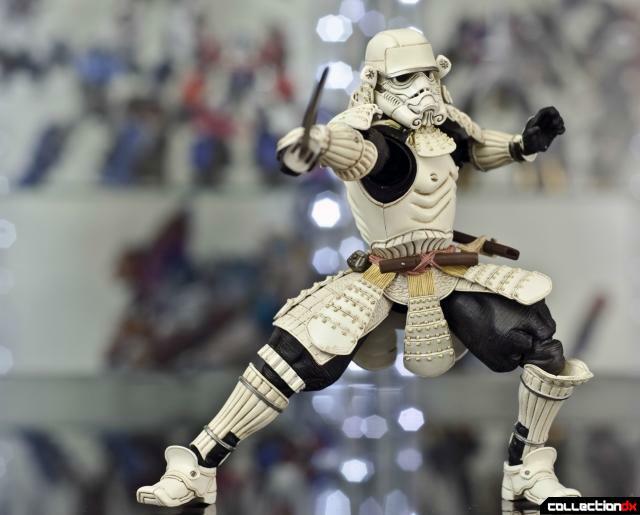 You REALLY got some great poses out of this, so it looks like something I wouldn't be regretting after the purchase.